Imaninezhad, M., Yan, T., Najafizadeh, A. (2016). Strain-Induced Martensite Transformation Simulations during Cold Rolling of AISI 301 Austenitic Stainless Steel. International Journal of Iron & Steel Society of Iran, 13(2), 26-30. M. Imaninezhad; T. Yan; A. Najafizadeh. "Strain-Induced Martensite Transformation Simulations during Cold Rolling of AISI 301 Austenitic Stainless Steel". 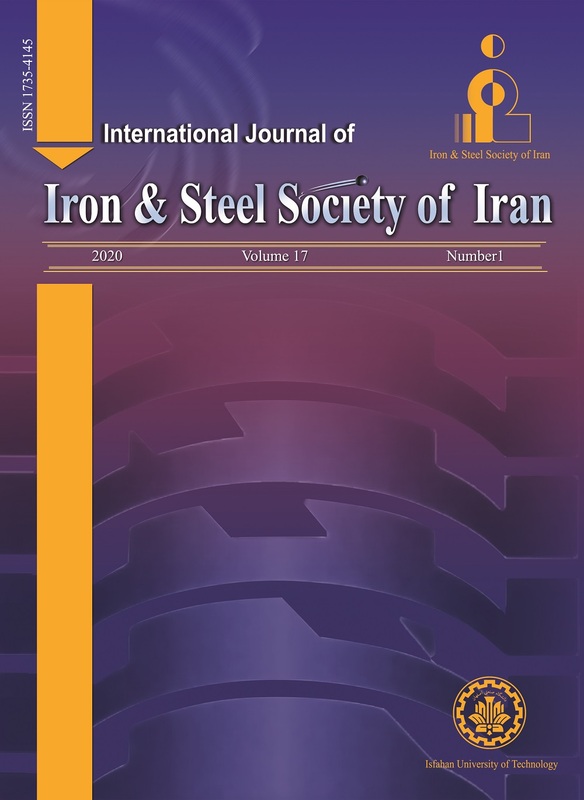 International Journal of Iron & Steel Society of Iran, 13, 2, 2016, 26-30. Imaninezhad, M., Yan, T., Najafizadeh, A. (2016). 'Strain-Induced Martensite Transformation Simulations during Cold Rolling of AISI 301 Austenitic Stainless Steel', International Journal of Iron & Steel Society of Iran, 13(2), pp. 26-30. Imaninezhad, M., Yan, T., Najafizadeh, A. Strain-Induced Martensite Transformation Simulations during Cold Rolling of AISI 301 Austenitic Stainless Steel. International Journal of Iron & Steel Society of Iran, 2016; 13(2): 26-30.
result, was under the most friction; thus, the stress reduced away from the surface toward the center of the sheet. J. Talonen, H. Hänninen, P. Nenonen and G. Pape: Metall. Mater. Trans. A., 36 (2005), 421. M.Rd. Rocha, and CASd. Oliveira: Mater. Sci. Eng. A., 517(2009), 281. I. Mészáros, J. Prohászka: J. Mater. Process. Tech., 161(2005), 162. J.A. Lichtenfeld, C.J. Van Tyne, MC. Mataya: Metall. Mater. Trans. A., 37(2006), 147. J. Talonen, H. Hänninen: Acta Mater., 55(2007), 6108. K. Mumtaz, S. Takahashi, J. Echigoya, L. Zhang, Y. Kamada, M. Sato., J. Mater. Sci. Lett., 22(2003), 423. K. Tomimura, S. Takaki, S. Tanimoto, Y. Tokunaga: ISIJ Inter., 31(1991), 721. K. Spencer, J.D. Embury, K.T. Conlon, M. Véron, Y. Bréchet: Mater. Sci. Eng. A., 387(2004), 873. A. A. Lebedev, V.V. Kosarchuk: Int. J. Plast., 16(2000), 749. P. Haušild, P. Pilvin, M. Karlík: Eur. Symp. on Martensitic Transformations, (2009), 06016. S. Berveiller, M. Kemdehoundja, E. Patoor, D. Bouscaud, M. Berrahmoune: Eur. Symp. on Martensitic Transformations, (2009), 06005. H. N. Han, C. G. Lee, C. S. Oh, T.H. Lee, S.J. Kim: Acta Mater, 52(2004), 5203. R.G.Stringfellow, D.M. Parks, G.B. Olson: Acta. Metall. Mater., 40(1992), 1703. G.B. Olson, M. Cohen: Metall. Trans. A., 6(1975), 791. O.M. Heeres, A.S. Suiker, R. de Borst: Eur. J. Mech. A-Solid., 21(2002), 1. N. Ohno, J.D. Wang: Int. J. Plasticity., 9(1993), 375. C. Livitsanos, P. Thomson: J. Mater. Sci., 12(1977), 2209. M. Eskandari, A. Najafizadeh, A. Kermanpur, M. Karimi: Mater. Des., 30(2009), 3869. M. Karimi, A. Najafizadeh, A. Kermanpur, M. Eskandari: Mater. Charact., 60(2009), 1220.